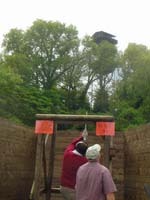 The Inter-Livery Clay Shoot took place on the 20th May at the Holland & Holland shooting ground in Northwood, Middlesex. This annual event is organised by the Worshipful Company of Environmental Cleaners and raises a significant sum of money for charity. After a breakfast buffet, with bacon sandwiches and croissants on offer, a record 99 teams battled it out over a testing course and made it a very competitive year. 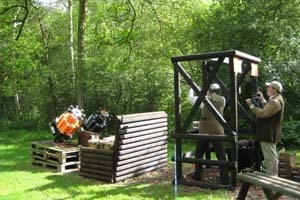 Holland & Holland put on a very well managed, impressive layout and a thoroughly enjoyable and challenging shoot. 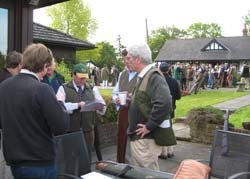 The Feltmakers’ teams were organised by Brian Minnighan. 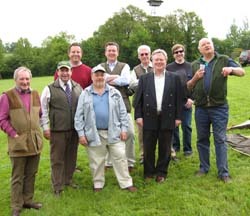 Both the Master, and Past Master Horsman joined them on the day to provide their support. It was a fun day, the sun shone and both teams put in creditable performances, scoring 223 and 188, respectively; an improvment upon their positions in the previous year. The highest scoring team was the non-livery Security Professionals with 316 and the highest scoring livery team was the Horners no.2 team with 309. 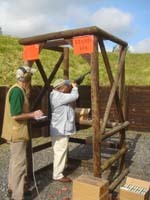 The second and third livery team positions were both taken by teams from the the Gunmakers Company. With the experience of past years, when we didn’t finish the course until after 2.00 pm, Brian had encouraged the Feltmakers to make an early start, which allowed us to finish around 12.30. We then made our way to the specially erected marquee for a hearty lunch. The buffet included two whole roast pigs, which proved attractive to hungry liverymen, but many other dishes were also on offer. The date for next year’s competition is already set as Wednesday 19th May, and this will again take place at Holland and Holland.